A flavor packet is a dry mix, containing concentrated flavor and color that can be added to Frostline vanilla dry mix nondairy soft serve and yogurt mixes to easily and economically create additional flavor options. Sugar, Caramel Color, Natural & Artificial Flavor (Contains Maltodextrin, Arabic Gum, Salt, Molasses, Lactic Acid). Place 2 gallons of cold tap water into a sanitized mixing container. Stir in one flavor packet with wire whip. When flavor packet is thoroughly dissolved, add one 6 lb. 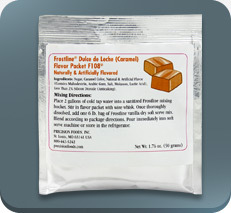 bag of Frostline vanilla dry mix nondairy soft serve. Blend according to the directions and place in a soft serve machine or store in refrigerator (less than 40 F). Note: Frostline Flavor Packets can also be used to flavor Frostline Smoothie Base Mix. See Smoothie Base Mix Spec Sheet for details.